Inventory Session windows (Inventory Issues, Inventory Receipt, Inventory Adjustments, Inventory Transfers, Inventory Assemblies, and Inventory Balance Adjustments) in Acctivate contain two dates which can be set, the Transaction Date and the Document Date. After posting an inventory session, additional dates such as the session created date and printed date, are printed on the session form. These dates provide valuable information as well as affect how inventory transactions are calculated. The upper right hand of an inventory session window contain a session number and date field, which is the transaction date. The transaction date is the date in which the inventory transaction will be posted. For example, if you post an inventory receipt with a transaction date of today, the inventory will be added into Acctivate on today’s date. You are able to back date a transaction, however you should use caution and understand how it will affect transactions after the posted transaction date. 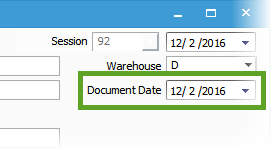 The document date is used as a reference date and has no effect on when the inventory gets posted. This can be used to represent the date of the inventory session document. For example, you may create an Inventory Assembly session today, however the Assembly session might not be posted for a couple of days. In this instance the Document Date could be used to represent when the work work order was printed. When the assembly is complete you would update just the transaction date and post the session. 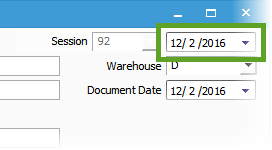 Created Date: This is the date the inventory session was created. This will usually be accompanied by the user who created the session. This date cannot be modified. Print Date: This is often displayed at the bottom of the form with a time stamp. This represents when the form/session report was printed and therefore will change each time you reprint a session.